The files affected by this error are just the Style, chosen and jquery-gentleselect (other CSS files that are imported in the index in the same way work well and without error). I've already checked my MIME type and text/css is already on CSS. Honestly I'd like to start by understanding the problem (a thing that seems I cannot do alone). Browsers make HTTP requests to servers. The server then makes an HTTP response. Both requests and responses consist of a bunch of headers and a (sometimes optional) body with some content in it. If there is a body, then one of the headers is the Content-Type which describes what the body is (is it an HTML document? An image? The contents of a form submission? etc). When you ask for your stylesheet, your server is telling the browser that it is an HTML document (Content-Type: text/html) instead of a stylesheet (Content-Type: text/css). I've already checked my myme.type and text/css is already on css. Then something else about your server is making that stylesheet come with the wrong content type. Use the Net tab of your browser's developer tools to examine the request and the response. This is a very important caveat to remember. The base tag needs to not only be in the head but in the right location. I had my base tag in the wrong place in the head, it should come before any tags with url requests. Basically placing it as the second tag underneath the title solved it for me. I also had problem with this error, and came upon a solution. This does not explain why the error occurred, but it seems to fix it in some cases. Don't forget about the: .. (double dots). My issue was simpler than all the answers in this post. I had to setup IIS to include static content. I was also facing the same problem. And after doing some R&D, I found that the problem was with the file name. The name of the actual file was "lightgallery.css" but while linking I has typed "lightGallery.css". It worked well on my localhost (OS: Windows 8.1 & Server: Apache). But when I uploaded my application to a remote server ( Different OS & Web server than than my localhost) it didn't work, giving me the same error as yours. So, the issue was the case sensitivity (with respect to file names) of the server. Based on the other answers it seems like this message has a lot of causes, I thought I'd just share my individual solution in case anyone has my exact problem in the future. Our site loads the CSS files from an AWS Cloudfront distribution, which uses an S3 bucket as the origin. This particular S3 bucket was kept synced to a Linux server running Jenkins. The sync command via s3cmd sets the Content-Type for the S3 object automatically based on what the OS says (presumably based on the file extension). For some reason, in our server, all the types were being set correctly except .css files, which it gave the type text/plain. In S3, when you check the metadata in the properties of a file, you can set the type to whatever you want. Setting it to text/css allowed our site to correctly interpret the files as CSS and load correctly. Essentially the problem can be caused when every request, including those for static content are being authenticated. 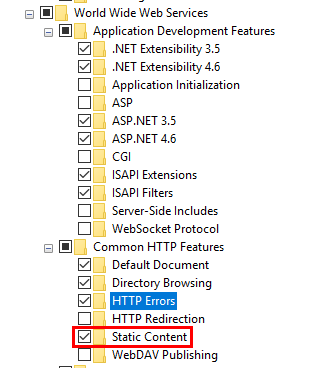 And a path called "pages"
Excluding these paths "/plugins/**" and "/pages/**" from authentication made the errors go away. 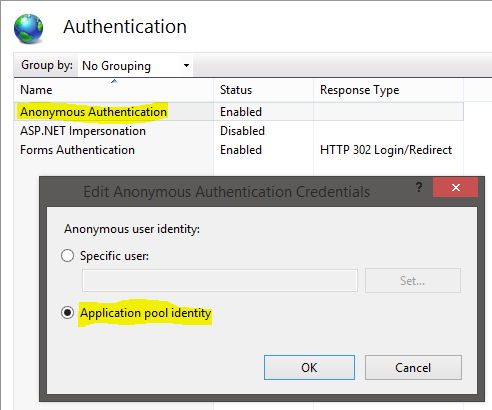 Setting the Anonymous Authentication Credentials to Application Pool Identity did the trick for me. In my case using ng-href instead of href solved it for me. i was facing the same thing, with sort of the same .htaccess file for making pretty urls. after some hours of looking around and experimenting. i found out that the error was because of relatively linking files. the browser will start fetching the same source html file for all the css, js and image files, when i would browse a few steps deep into the server. or use absolute links for all your files. then the container interpret your css url, and goes to the servlet instead of going to the css file. This means that every request, including those for static content, being authenticated. I also face this problem recently on chrome. I just give absolute path to my CSS file problem solve. I want to expand on Todd R's point in the OP. In asp.net pages, the web.config file defines permissions needed to access each file or folder in the application. In our case, the folder of CSS files did not allow access for unauthorized users, causing it to fail on the login page before the user was authorized. Changing the required permissions in web.config allowed unauthorized users to access the CSS files and solved this problem. In case anyone comes to this post and has a similar issue. I just experienced a similar problem, but the solution was quite simple. A developer had mistakenly dropped a copy of the web.config into the CSS directory. Once deleted, all errors were resolved and the page properly displayed. I came across the same issue whilst resuming work on a old MEAN stack project. I was using nodemon as my local development server and got the same error Resource interpreted as stylesheet but transferred with MIME type text/html. I changed from nodemon to http-server which can be found here. It immediately worked for me. This occurred when I removed the protocol from the css link for a css stylesheet served by a google CDN. I was facing similar issue. And Exploring solutions in this fantastic Stack Overflow page. When I uploaded them the issue runs away ! And code runs and page rendered without any another error! So, moral of the story is don't forget to make sure that all of your js files are uploaded where the page is looking for them. I came across the same issue with a .NET application, a CMS open-source called MojoPortal. In one of my themes and skin for a particular site, when browsing or testing it would grind and slow down like it was choking. My issue was not of the "type" attribute for the CSS but it was "that other thing". My exact change was in the Web.Config. I changed all the values to FALSE for MinifyCSS, CacheCssOnserver, and CacheCSSinBrowser. Once that was set the web site was speedy once again in production. and then I navigate to a route say; localhost:3000/artist and refresh, I get the error. Also, the tomcat configuration wrt handling css MIME-TYPE was already present. Not the answer you're looking for? Browse other questions tagged html css google-chrome or ask your own question. Angular app not loading CSS and JS on refreshing page?